There is a pool on the river where a friend of mine, Barry Anderson, caught a shed-load of barbel a few weeks ago, some nice ones too. It is not very big. It is a hole really but I thought it might not be in the best taste to write “Barry´s Hole” as a title to this post in case I got a fat lip when we next meet. The pool is small and, truth be told, I have known about it for a few years and managed to extract a few barbel from it, though none of the bigger ones I have seen in there. Those big boys will ignore a nymph and just cruise around nonchalantly while their repeated refusals send your heart rate through the roof. Fly fishing is supposed to be relaxing but, Christ, there is nothing relaxing about seeing a bigger barbel than you have ever landed, swim up to take a look at your nymph and then turning away again! Barry´s catch followed a spell of heavy rain and the river was relatively high and coloured. Those barbel, which are generally spooky in clear conditions, just got their heads down and found the bait that Barry was offering perfectly acceptable. I am not going to disclose the location of this little pool out of respect for Barry´s wishes. He asked me not to do this and, frankly, it is only a small pool and can do without a lot of pressure. As it happens, on a Sunday the locals leap in there and swim around so the fish probably need a little time to recover their composure! I have noticed that barbel, or at least the bigger ones, like to remain in areas which have cover, depth or a combination of both. The rivers here become pretty skinny in the summer and the deeper stretches become refuges when times get hard and, no doubt, the bigger fish have lived through a few summers and may be reluctant to go too far away. Perhaps they leave these places to forage more widely at night. The more time I spend on the river the more these fish absorb me. They come and go. Stretches of river can hold fish one day and appear empty the next. As the river floods the fish wander and as it drops they return to their old haunts. They must have some sense of how the river is changing to allow them to do this. Any miscalculation is likely to be risky, lethal even. So I reckon that places like Barry´s pool will be where I will go later in the summer in order to see if I can fool one of those big fish. I wouldn´t put money on me getting one but it will be good fun trying. 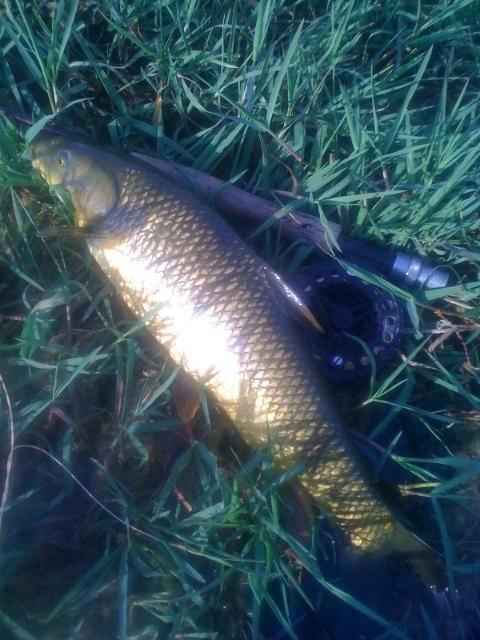 This is a typical fish from Barry´s pool. I took a couple there on Sunday morning. There are much bigger ones in there.